The Answer is YOUR ANSWER to all heifer breeding questions! It's extremely rare to find an Angus bull this cool fronted, with this cool of a profile, yet maintain soundness, thickness and body depth. 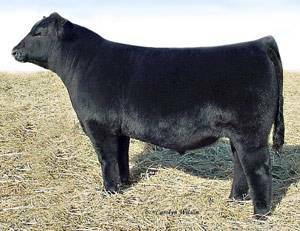 He was a sale feature at the 2008 ND State Angus Sale and was said by many to be the best display bull overall at the 2009 Iowa Beef Expo. In addition to how great he looks, analyze his EPDs and you become more appreciative of this super stud. He's in the top 25% for Calving Ease and low Birth Weight EPD, yet top 15% Weaning and top 20% Yearling Weight and Milk EPD. We also admire the maternal pedigree of this bull, including legends like 8180, New Design 878 & New Frontier 095. The Answer is your answer to breeding heifers of all breeds this season!